Denver • On a night the Jazz finally found the defense gone missing so long ago it was about to go on the side of a milk carton, they saw their shooting touch disappear. On a night initially buoyed by the return of Donovan Mitchell from a hamstring injury, it turned scary when he came down awkwardly after a contorting fourth-quarter layup attempt resulted in him twisting his ankle and being carried to the locker room. On a night where there were so many encouraging signs for Utah, things still managed, somehow, to get worse. 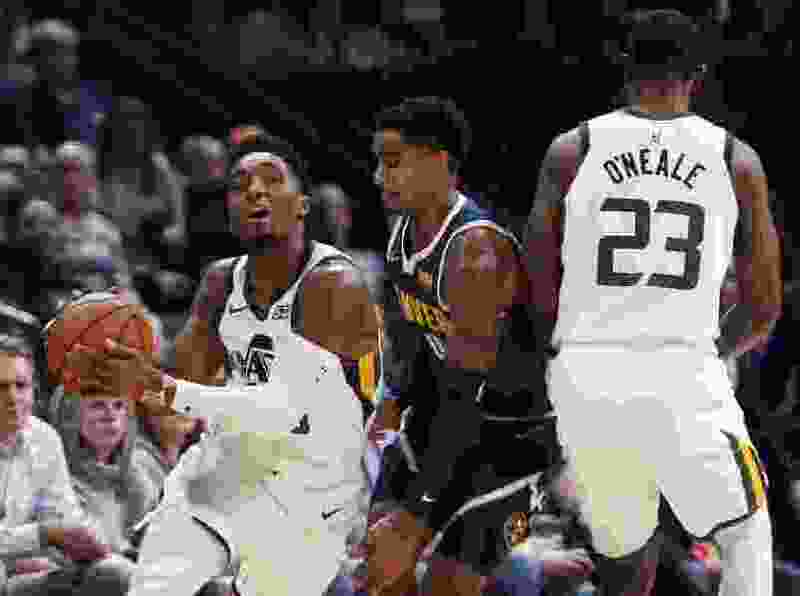 Mitchell eventually returned, but far too late to make a difference, as an absolutely dominant fourth quarter by Denver resulted in a 103-88 Nuggets victory that sent the Jazz to their third straight loss and dropped them to 4-5 this season. The Jazz shot just 40.7 percent from the field for the game, and made only 6 of 31 from deep (19.4 percent) in the loss. Utah’s otherwise strong defensive effort fell apart late, as Denver outscored Utah 35-15 over the final 12 minutes. After the loss to Minnesota, and again after the loss to Memphis, Jazz players and coaches bemoaned the team’s dearth of defense. Apparently, it just got shipped out to the Pepsi Center a couple nights early. On Saturday night against the Nuggets, Jazz hands were everywhere, racking up 12 steals. Derrick Favors looked reinvigorated, closing down the lane. And Denver’s vaunted offensive attack was disjointed for most of the night — committing 17 turnovers and making just 9 of 28 from deep. Of course, the operative word there was most. Mitchell said when he twisted his ankle in the fourth, it was “not a great feeling.” And while he allowed that he should be OK, vowing to start taping his ankles now, his feelings about the game were decidedly mixed. Like Snyder, he attributed the fourth-quarter defensive lapse to the team’s offensive issues finally manifesting problems on the other end of the court. He said his 7-for-22 effort was a big part of the problem. And yet, counterintuitively, because of that, he actually came away feeling encouraged. He may be on to something. Joe Ingles was 1 for 5. Ricky Rubio was 3 for 10. Only Jae Crowder (8 for 15), Derrick Favors (6 for 10) and Rudy Gobert (5 for 9) hit over half their attempts. And two of those three are not exactly adept at spacing the floor. The Jazz had actually taken control by the end of the third quarter, going on a 14-5 run to grab a 73-68 lead. It didn’t last, however. Malik Beasley’s 3-pointer with 9:20 to go gave Denver back the lead. Then Mason Plumlee beat the shot clock by draining the first 3 of his career over a sagging-off Gobert. Trey Lyles hit free throws, Juancho Hernangomez hit free throws, Beasley drained another 3, and suddenly the wheels came off, as the Jazz had nothing to counter it. Still, while the Jazz lamented their continuing inability to put a full game together, and acknowledged that there are frustrating inconsistencies to their game, Mitchell reiterated that it’s too early yet to panic. • Denver outscores the Jazz 35-15 in the fourth quarter to pull away in a game that had been back-and-forth all night. • The loss is Utah's third in a row, and drops the team to 4-5 on the season. • Donovan Mitchell, who left the game for several minutes in the fourth quarter with a sprained ankle, said postgame he was OK. He shot just 7 for 22.